Many years ago I learned a valuable lesson about purchasing gear from a waitress. I was out to celebrate an anniversary with my wife at a restaurant called the Lobster Trap. My wife ordered the lobster bisque and I ordered the clam chowder. I was surprised when the waitress stopped me and said, “No, you don’t want the chowder, you want the lobster bisque”. I had my heart set on the chowder, brushed off the recommendation, and was surprised with how forward our server was. Curiosity got the better of me after a few sips of the chowder though and I asked for a spoon of my wife’s soup. When the waitress came back to bring us our drinks, I ordered myself a bowl of lobster bisque. That dining experience taught me an important lesson about humility. Our waitress, I would come to learn, had been working there for years and had probably seen countless people regret not ordering the bisque after sharing their neighbour’s bowl. Not that there was anything wrong with the chowder, it’s just that there was a better option for me after she knew I was interested in soup. Being open to suggestions from people you trust and learning from other people’s experiences can yield great rewards if you have an open mind. Rewind almost four years ago to when I was looking for an insulating mid layer. I was already sold on pretty much anything that was a part of the Protective Combat Uniform layering system, and having the Level 3 Fleece was pretty much the only option on my list. This was about the same time I started noticing that Arc’teryx was appearing in more retail stores around Toronto. The prices of their pieces compared to the prices of PCU seemed outrageous even though I knew their quality was almost unparalleled. When I spoke to the sales people at outdoor retail stores like Atmosphere, Higher Ground and Sporting Life, one thing seemed to stay consistent. They all seemed to recommend the Atom LT. In fact, one representative told me that they were sold out of the LTs because the staff had bought them all. At this point, I hadn’t made the connection that the lesson I had learned all those years ago was applicable to this situation. So I picked up the Level 3 and was impressed with it’s performance. As the winter approached, I saw my wife getting increasingly jealous, and she put in the request for a “Level Fuzzy” to keep her warm. She wasn’t tied to something in coyote brown like I was, and like most items that are available to the armed forces, there are usually a number of great civilian options. As I shopped around I found a number of colourful fleeces that would fit the bill, but then I found an Atom LT on the rack. Now don’t get me wrong, like the clam chowder, level 3 fleece was great, but the geardo inside of me was curious about that lobster bisque. It wasn’t fuzzy, but it was certainly warm. Was she disappointed, or was she pleased with my decision? Well, a year ago she got me the Atom LT LEAF hoody for my birthday. She said that she felt it wasn’t fair that she had one and I didn’t. So what are the difference between the commercial and the LEAF version? Besides coming in subdued colours and being $11 cheaper, the Gossamera ripstop face fabric is 40d rather than 20d which should make it more durable but also a little heavier. The commercial Atom LT is 360g where the LEAF version is 445g. Some features that might be of interest to those who those who need to run communications gear will be happy to hear that the LEAF version has two internal media ports unlike the commercial version. As well the cord locks that are used to adjust the drawstrings around the waist are routed upward and should not interfere with the use of your holster or gear on your belt. The Polartec Power Stretch does a great job of dumping extra hot air from under your arms. The Atom LT has two versions, but the reason why I like the hoodie is based on a few things. It is nice to have a way to keep your head and ears warm without packing a toque. I don’t like sleeping in barrel bags, so when the temperature goes down, my shoulders and upper back get cold. I’ve slept a few nights with the Atom LT and it’s been a much more enjoyable sleep having the hood stay in place rather than trying to find my hat in a dark tent after it has fallen off. A few of my friends avoid hoods, as they say it bothers them and that it gets in the way. That isn’t really a problem for me though as the majority of the snowboard jackets and apparel I’ve had over the years have had hoods; so besides thinking they look cool compared the the Mandarin collar, I don’t really notice the added fabric. The stretchy Polartec Power Stretch with Hardface technology helps with breathability, but it’s a bit of a two way street. If you are using this as an outer layer, then you will notice cold air seeping in when it’s windy. 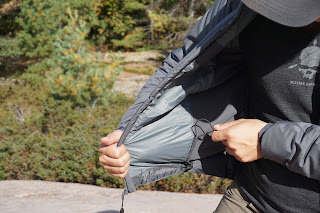 But you guys are geardos, so layering up with a hardshell or softshell will solve that problem easily. The two side pockets are massive, and have a thin fleece liner on one of the walls. There is one internal breast pocket that is also very generous in size, but does not really effect the profile of the jacket. The breast pocket and the media port just above. A very serious issue I had with the Atom LT was with the tapered elastic cuff. While it does a great job of keeping the cold air out, it also makes it difficult to get my watch out to find out what time it is. After a few months of use, I noticed that the stitching came apart at the seam from constantly pulling it over my G-Shock. 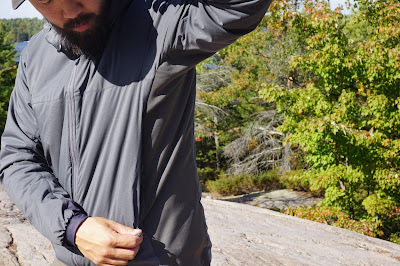 I contacted Arc’teryx, got an RA number, dropped it off at their downtown Toronto location, and a few weeks later I got a brand new jacket at no extra charge. Now, I am very conscious of not checking my watch now when I wear the Atom LT which is kind of annoying. As far as performance in the cold goes, I have been very impressed. 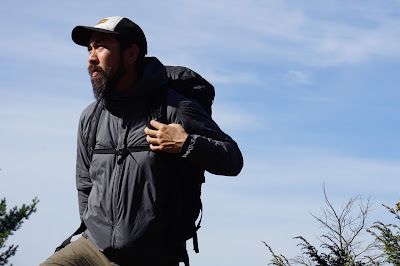 The jacket keeps me comfortable walking around at temperatures ranging from 5-15°C, and if I’m jogging or if I’m on my bike, going down to 0° with nothing more than a T-shirt underneath is fine. If it dips below freezing, An outer layer and a grid fleece is usually added to keep me smiling if I’m on the slopes. The fabric is treated with DWR, and I’ve noticed that when it’s raining, it will hold up for about 10 minutes before I start to feel wet. 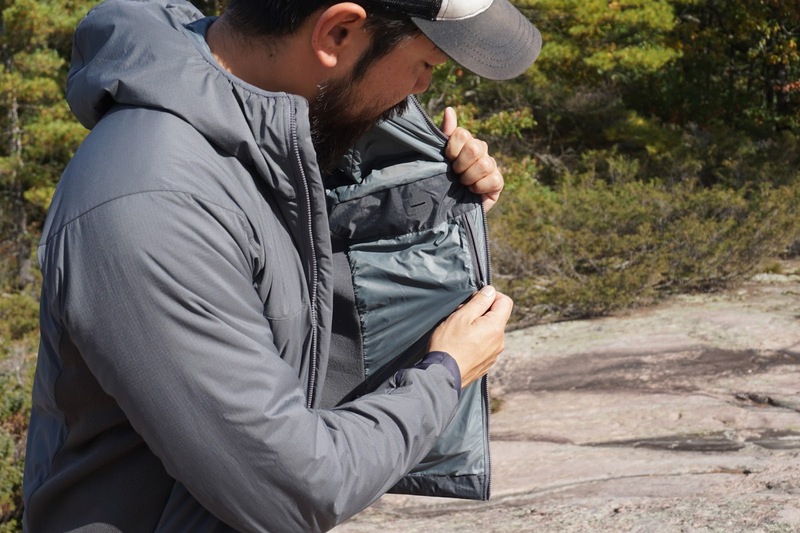 The Atom LT is by no means a rain jacket, but it’s nice to know it will keep my dry as I reach for my hardshell. For things like winter camping where I’m not moving around as much, I’d rather go with something more substantial. The Atom LT uses 60g/m² Coreloft, where the Atom SV uses 120/m². So at the moment, when the forecast is calling for really cold weather I reach for my PCU level 3. Going forward I’d like to check out the SV because if it compresses as well last the LT I’m sold as the PCU takes up a lot of room in a pack. At the end of the day, is the Atom LT my lobster bisque? Is it the warmest mid layer I own? No, PCU Level 3 is still my go to. Is it the lightest mid layer I own? No, at 15.7 oz, it’s slightly heavier that my Patagonia R2 (13.8 oz). 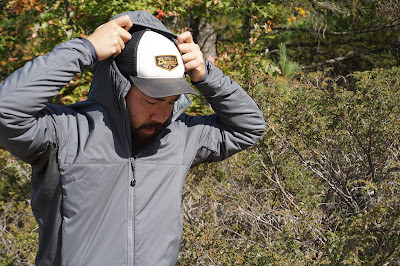 Is it the most versatile mid layer I own? Yes it is. The wind and rain protection it provides allows me to wear it in more situations and environments than the other two. I definitely notice myself reaching for the Atom more often than any of the other options. To me, the Atom LT is a winner because it's warm, well made, and comfortable. The added bonus is that I blend in with my buddies when I’m at the range, and I don’t look like that “tactical” nerd if I’m walking around downtown with my buddies trying to find a pub. Am I upset that I got the Level 3 first? 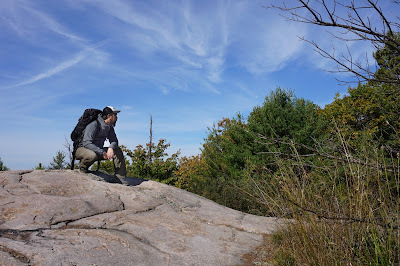 Not at all, it helped me complete a set, and without it, I wouldn’t have been able to put into perspective what I like about the Atom LT. Additionally, having more than one of something allows me to use one for everyday, and the other for trips, but that’s a topic for another day. The waist cinch is directed up to get out of the way of items on your belt. Thanks for another fantastic review. I looked at those and really like the model except for the price they're selling here in Australia and New Zealand. It makes this fantastic brand outside of reach for many. Cheers, thanks dude! That's a bummer about the price. Out of curiosity, what are they charging for the jacket where you are? The Canadian dollar and Australian dollar are almost at par right now. Will have to go back to shop and check but as I remember it was in vicinity of AU$400 in shop in Melbourne. Here in NZ is a little more in NZ$, sold by Bivouac Outdoor. My best bet with Arcteryx gear is eBay, assuming they don't slap a customs import duty on arrival. Thx man for great review! Now I really know that I want LT jacket in LEAF version!! :) greetings from Russia! Thank you Sir, for the great review of the Leaf Atom LT Hoody. I live in the US and wanted to avoid looking 'tactical' But, when I saw the jacket on you, it looked great and ordered one in the same color as yours. You are correct, it is a great piece of clothing and I am now a fan of your blog....Many Thanks, Will.